Windows Defender Exploit Guard (Windows Defender EG) is a new set of host intrusion prevention capabilities for Windows 10, allowing you to manage and reduce the attack surface of apps used by your employees. The score of Windows Defender Exploit Guard is measured against the below improvement areas including cloud-based protection. The configuration of Windows Defender Exploit Guard is currently documented for using PowerShell and Group Policies. However there is a Windows 10 Configuration Service Provider (CSP) for Windows Defender Exploit Guard which make it’s possible to configure Exploit Guard using Microsoft Intune (or other MDM solutions). Note: At time of writing there is no Windows Defender Exploit Guard profile available neither in Configuration Manager & Microsoft Intune. I expect this will become available soon as Windows 10 Fall Creators Update is general available now. Windows Defender Exploit Guard will work with Windows 10 Fall Creators Update (1709) and Windows Defender Antivirus real-time protection must be enabled. Attack Surface Reduction helps prevent actions and apps that are typically used by exploit-seeking malware to infect machines. The Exploit Guard Attack Surface Rules are configured by using the Defender node of the Policy CSP. Defender/AttackSurfaceReductionRules This policy setting enables setting the state (Block/Audit/Off) for each Attack surface reduction (ASR) rule. Each ASR rule listed can be set to one of the following states (Block/Audit/Off). Controlled Folder Access helps you protect valuable data from malicious apps and threats, such as ransomware. The protected folders include common system folders, and you can add additional folders. You can also allow or whitelist apps to give them access to the protected folders. Network Protection helps reduce the attack surface of your devices from Internet-based events. It prevents employees from using any application to access dangerous domains that may host phishing scams, exploits, and other malicious content on the Internet. It expands the scope of Windows Defender SmartScreen to block all outbound HTTP(s) traffic that attempts to connect to low-reputation sources (based on the domain or hostname). In order to enable Windows Defender Exploit Guard using Microsoft Intune, we created a custom profile which contains the required settings to improve our organization security score. Note: The setting Block Office applications from injecting into other processes with GUID 75668C1F-73B5-4CF0-BB93-3ECF5CB7CC84 is excluded from the baseline. Consider enabling this rule in Audit or Block mode for better protection. 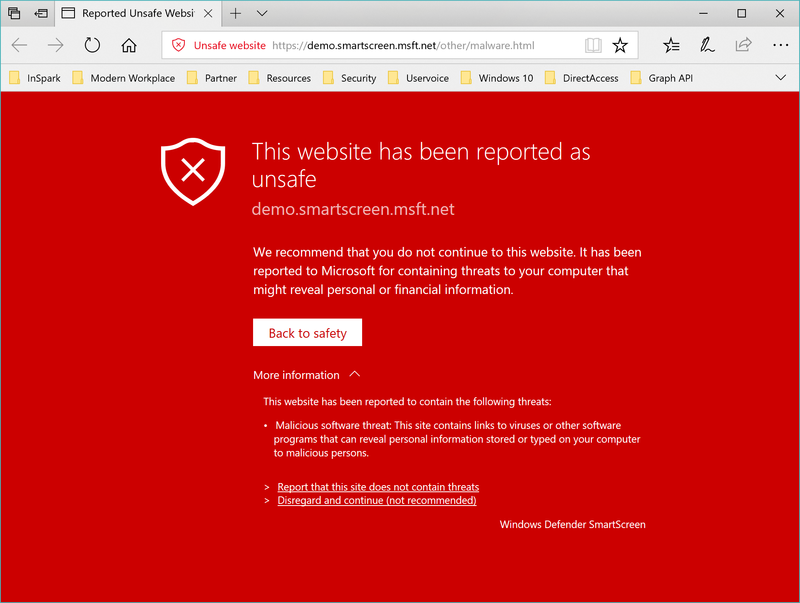 Windows Defender SmartScreen helps to protect your employees if they try to visit sites previously reported as phishing or malware websites, or if an employee tries to download potentially malicious files. Analyzing visited webpages looking for indications of suspicious behavior. If it finds suspicious pages, SmartScreen shows a warning page, advising caution. Checking the visited sites against a dynamic list of reported phishing sites and malicious software sites. If it finds a match, SmartScreen shows a warning to let the user know that the site might be malicious. Checking downloaded files against a list of files that are well known and downloaded by many Windows users. If the file isn’t on that list, SmartScreen shows a warning, advising caution. SmartScreen can be configured using the Microsoft Intune UI or by configuring a custom profile (OMA-URI). The SmartScreen UI section is split in a browser part and a system part. If you manage your policies using Microsoft Intune, you’ll want to use these MDM policy settings. All settings support both desktop computers (running Windows 10 Pro or Windows 10 Enterprise, enrolled with Microsoft Intune) and Windows 10 Mobile devices. 0 . Turns off Windows Defender SmartScreen. 1. Turns on Windows Defender SmartScreen. 0 . Turns off Application Installation Control, allowing users to download and install files from anywhere on the web. 1. Turns on Application Installation Control, allowing users to install apps from the Microsoft Store only. 0 . Turns off SmartScreen in Windows. 1. Turns on SmartScreen in Windows. 0 . Employees can ignore SmartScreen warnings and run malicious files. 1. Employees can’t ignore SmartScreen warnings and run malicious files. 0 . Employees can ignore SmartScreen warnings. 1. Employees can’t ignore SmartScreen warnings. 0 . Employees can ignore SmartScreen warnings for files. 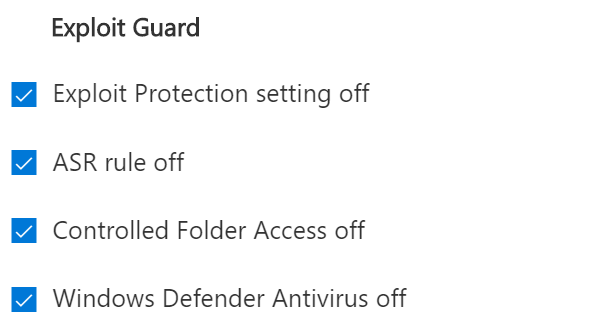 Now we configured the device restriction profiles in Microsoft Intune for both Windows Defender Exploit Guard and Windows Defender SmartScreen let’s have a look at the improvements areas. Now we configured and enabled Exploit Guard in block mode we do see a significant improvement over time for this improvement area. In my previous blog we’d reported a score of 35,8 for Exploit Guard, after applying the security baseline configuration we’ve a new score of 66,7 which is almost doubling the score. The Security Analytics dashboard provide organizations valuable insights of their endpoint security and enables to easily enhances and maximize their security potential. Where Windows Defender Advanced Threat Protection provides organization continues valuable insides of their current security operations- and analytics performance, Microsoft Intune enables you to translate the useful insights into enforceable measures. Special thanks to Ran Mitelman (MSFT) for providing valuable insights.